Most of the time when you start using an app, it will be in this context: You’ll go to sign up for a new website and realize you can log in with Facebook. Or a friend will invite you to play a game with him. But if you’re in the market for new games and apps to try out and don’t know where to start, check out the App Center. You can get to it by clicking the App Center link in the left sidebar on any page of Facebook. 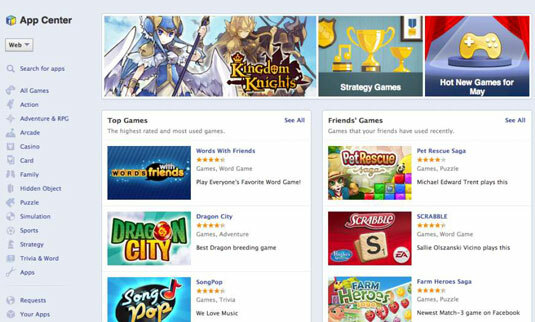 The App Center gives you the tools you need to find games and apps that are popular across Facebook and with your friends. App pages within the App Center are also how you can assess whether an app is one you want to be using. When you land in the App Center, you may notice it has a distinct bias toward games. The navigation menu on the left side of the page lets you browse games by category, such as strategy or sports. All the rest of the apps are under the blanket category of Apps. The App Center also displays Top Games and Friends’ Games to try to expose you to popular games. When you click a particular category on the left, the display in the center of the page changes to show you suggested games in that category. You can click the tabs at the top of these suggestions to view Top Rated, Trending, and Friends’ Games in that category. App pages work a bit like a Timeline for an app, complete with a cover photo, profile picture, and name. The app install information is on right side of the app page, but this page has a lot more information that may be relevant as you seek to learn more about an app. 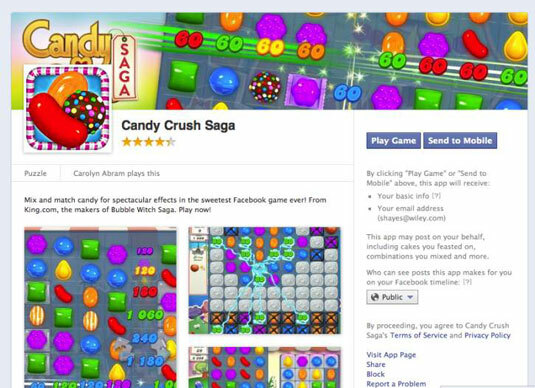 Ratings: As people use apps, the app may prompt them to rate it on a five-star scale. You can see the rating right under its name at the top of the page. Category: Underneath the app’s profile picture is the category that it fits into. Who uses it: Next to the category is a list of which of your friends use that game or app. Description: The text under the category and who uses the app explains what the app does and what people use it for. Screenshots: If the description doesn’t quite communicate what an app or game will be like, then hopefully the screenshot(s) can help you get a sense of it. Info: At the bottom of an app’s page in the App Center, basic info like who created the app and other platforms where the app is available can help you find out just a little more about the app. Your friends are using it. The first mark of a good application is that your friends are using it; this means the friends you interact with most on Facebook. This usually means it’s fun, useful, and generally good. It has a good rating. You can see an overall rating of an application right under its name. A good rating means the app is likely to be really fun and enjoyable to the people using it. These ratings don’t always account for bad app behavior like spamming of friends, however, so it’s not the only thing to look at. The info it’s asking for makes sense. When you click any of the blue buttons on the App Install Screen, you agree to give your info to the app, and listed below the blue buttons are the parts of your Timeline the app wants to access. If it’s asking for something that seems out of place, it’s worth pausing before you agree to give it this info. Many of the reasons you’d need help with an app are the same reasons you’d need help on Facebook: harassment, spam, something not working or being broken. However, because apps and games are built by outside developers, Facebook can’t help you with these problems. You will need to contact the developers of whatever app or game you’re using. Navigate to the app’s page in the App Center by searching for it in the search bar at the top of every Facebook page. When you see the app appear in the menu of results, click it to go to the app’s page. Click the Report a Problem link on the right side of the page. This link is below the App Install section of the page. When you click this link, a window opens with a menu of options for reporting problems. The top portion, Report to Facebook, is for reporting disingenuous, spammy, or otherwise offensive apps to Facebook. The bottom part, Contact the Developer, is for getting in touch with the developers of that app. Select the appropriate category of report in the Contact the Developer section. Each app or game has different protocols for helping you. When you click some, they take you to an outside website or forum where you can search for answers to your questions or solutions to your problems. Others, when clicked, display a pop-up window where you can submit information about your issue.